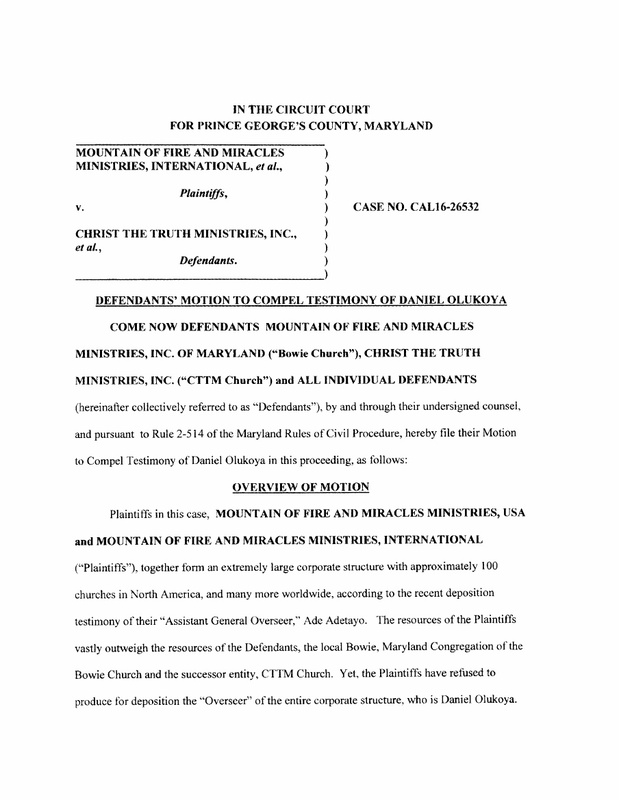 Daniel Olukoya, the General Overseer of Mountain of Fire and Miracles Ministries (MFM) falsely affirmed himself to be a legal resident of the State of Maryland in the United States for business purposes, official court documents show. Olukoya made the false claim in the Articles of Incorporation of the church in Baltimore in 2002. In the Articles of Incorporation filed with the State of Maryland Department of Assessment and Taxation, Olukoya claimed to be a Resident Agent for Service for MFM Baltimore, and personally signed the Articles in that capacity. (See certified copy of the Articles of Incorporation in story). Daniel Olukoya's certified copy of Articles of AssociationThe laws of the State of Maryland require all corporations or organizations applying for registration in the State to designate a person or organization, who must be a legal resident of the State of Maryland, as Resident Agent for Service. The Resident Agent for Service of any organization is primarily to receive court and other legal processes for and on behalf of the organization. Contrary to these stipulations, a SaharaReporters investigation reveals that Olukoya is not and has never been a legal resident of the State of Maryland. 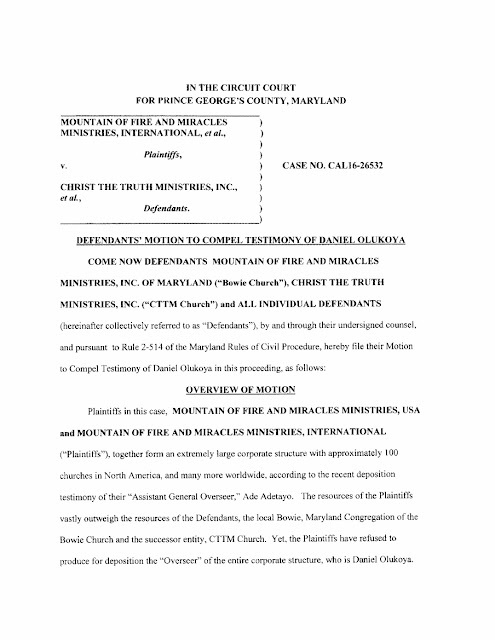 The Articles of Incorporation containing the man of God’s false declaration came to light in the filings before the Circuit Court for Prince Georges’ County of the State of Maryland in an ongoing lawsuit instituted by MFM International (Lagos) against Lawrence Adetunji and Ronke Adetunji, two former pastors of MFM Bowie, Maryland. Also joined in the suit are 11 former members of the church, as well as Christ the Truth Ministries. In their Motion to compel the testimony of Pastor Olukoya (see a copy of the Motion below), the defendants stated that they requested his presence at deposition or trial via a subpoena served through the plaintiff’s (Mountain of Fire and Miracles Ministries International’s) attorney, but the plaintiff refused to produce Olukoya for that purpose. “The purported grounds that plaintiffs have cited in refusing to produce Olukoya is that he is ‘not a party’ to the litigation and that he ‘resides in Lagos, Nigeria’ and is therefore beyond service of process by the court,” the defendants’ motion further states. 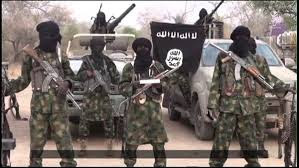 They argue that Olukoya’s testimony is crucial in the case because he is the signatory of at least three documents that are central to their defense in the case. They further assert that Olukoya is a Resident Agent for Service for Mountain of Fire and Miracles Ministries, Baltimore, as demonstrated in that Church’s Articles of Incorporation. According to the claim, as Resident Agent for Service in the State of Maryland, Olukoya has subjected himself to Maryland State Courts’ jurisdiction and therefore is not beyond service of process by the court. The defendants are therefore requesting the court to issue a subpoena to compel the attendance of Olukoya for deposition and at trial because his testimony is necessary for the purpose of justice in the case. As of the time of filing this report, the plaintiffs, MFM International have not filed a response to the defendants’ motion. Contrary to our earlier report, the trial is scheduled to start next Monday, October 23rd. It would be recalled that about two weeks ago, we reported that in the defense and counterclaims filed before the court, the former pastors of MFM accused the leadership of MFM International (Lagos) of making false declarations to the United States Customs for the purpose of evading payment of duties to the US government on books exported from Nigeria and sold to members of MFM in the US.